While the Mets’ bats were nowhere to be found last night the Yanks’ were quite active, but both teams fell short. Carlos Torres found himself in a pitchers’ duel against Kris Medlen of the Braves on Tuesday night. The game was scoreless until Daniel Murphy finally broke through with an RBI double to follow Eric Young’s triple in the top of the sixth, providing a lead which lasted just over an inning. After striking out the first batter in the bottom of the seventh, Torres gave up his first run on a homer off the bat of Evan Gattis. He walked the next man he faced, then gave up a 2-run shot to Andrelton Simmons, putting Atlanta ahead 3-1. That score held as both starters went a full 7 innings and the Braves took the second of three games. The Mets provided a fair bit more support to Dillon Gee on Wednesday, beginning with an Andrew Brown homerun that came after a Murphy triple in the first inning. Lucas Duda would flash some muscle as well when he led the third inning off with a homer, and Justin Turner later scored on a Juan Lagares groundout. Gee rounded out the inning with an RBI single to put New York up 5-0. Gee did not give up a run until BJ Upton smacked a sacrifice fly in the fifth, and did not allow another through the rest of his seven innings of work. Freddie Freeman launched a solo shot in the eighth to cut the lead down to 5-2, but that was the last run for Atlanta as the Mets avoided being swept by the Braves. 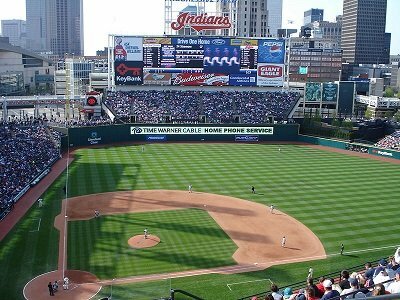 The team travelled to Progressive Field to face the Indians last night. Zack Wheeler, who has been quite impressive in his young career with the Mets, took the mound but gave up a run on a sacrifice fly in both of the first two innings. He settled down in the third and fourth, then gave up an RBI single to Carlos Santana in the fifth inning. Gonzalez Germen took over in the sixth, and gave up doubles to the first two batters he saw as the Indians took a 4-0 lead. Justin Turner hit his first homer of the year in the top of the seventh to put the Mets on the board, but New York would not score again and former Yankee Nick Swisher smashed a grand slam in the eighth to put the game well out of reach. Cleveland won 8-1. The Mets will try to even things up at 6:05 PM tonight and finish the series at 1:05 PM tomorrow. The Bronx Bombers dominated the White Sox by virtue of one huge inning on Monday, and found they would need a similar show of force to survive Tuesday’s follow up. Hiroki Kuroda, who struggled in his last several starts, gave up the first run of the day on an RBI single in the first inning. The Yanks tied the game in the bottom of the second on a double steal with Eduardo Nunez taking second and Vernon Wells going home, but Chicago would retake the lead on a 2-run triple in the fifth. Kuroda threw his last pitch when he gave up a solo shot to Alejandro De Aza in the seventh, putting the White Sox up 4-1. Thankfully, he was taken out of contention for a decision in the eighth inning as Alfonso Soriano scored a 2-run single and Curtis Granderson drove in the tying run. Nunez hit a 2-run double to put the Yanks up to 6-4, creating a lead that stuck as Mariano Rivera worked a 1-2-3 ninth to collect his 40th save. The two teams again found themselves tied early on in Wednesday’s finally. CC Sabathia gave up an RBI double in the top of the first, but Robinson Cano struck back with a solo shot in the bottom frame. The score remained 1-1 until a Lyle Overbay double in the fourth drove in Alex Rodriguez. Brett Gardner hit a 2-run triple shortly afterward, and Cano singled him home to put New York up 5-1. Soriano tacked on another run in the seventh, but what was a comfortable lead quickly began to dissipate in the eighth. After CC allowed two of three batters to single their way on the base path he was taken out for David Robertson. The prospective closer got the second out after giving up an RBI single, then issued a walk and allowed another 3 runs on two singles, bringing the lead down to just 1 run. Robertson was taken out, leaving Rivera to try working a rare 4-out save, which he did successfully. CC improved to 13-11 as Rivera got his 41st save and the Yanks swept the series with a 6-5 victory. After bidding farewell to the White Sox, the Yanks welcomed their bitter division rivals to town on Thursday. Ivan Nova pitched two scoreless innings before allowing the Red Sox to score two runs in the top of the third. Cano made up for the lapse with a 2-run double in the bottom half, but Nova continued to struggle for the rest of his short night. Boston broke the tie on a Middlebrooks solo blast in the fourth, leading to Nova being pulled at the start of the fifth. Preston Claiborne afforded Shane Victorino a leadoff homer, then gave up an RBI single to Mike Napoli. Adam Warren would later take over, but let a run score on a groundout to put Boston up 6-2. The Red Sox added another run in the top of the seventh, however the Yankees’ bats came alive in the bottom of the inning. Gardner got things started with a run-scoring single, and Cano added a run on a force out. Soriano singled Gardner home, and Granderson notched an RBI double. Overbay’s ensuing single drove two home, putting the Yanks on top 8-7. That rally ultimately fell short, as a dangerous Boston lineup scored a run off Rivera in the ninth inning to tie the game. New York was unable to pull ahead, and Victorino put the Red Sox back on top with an RBI single in the tenth leading to a 9-8 loss for the Yankees. The Yanks got out to an early lead behind Andy Pettitte last night, scoring two runs on Soriano’s 30th homer of the season in the first inning. The Red Sox managed an RBI single against Andy in the top of the second, but Nunez put New York back up by 2 with a run-scoring triple in the bottom half, and Chris Stewart added a sac. fly to bring him home. Boston scored again in top of the fourth, and Brett Gardner brought Mark Reynolds and Stewart home on his Major League-leading tenth triple of the year in the bottom. Will Middlebrooks homered off Pettitte in the top of the fifth, but the spread continued to grow later in the inning as Vernon Wells and Reynolds both hit RBI singles. Pettitte left his team with an 8-3 lead after six innings, however Phil Hughes would struggle mightily as he returned to the bullpen, loading the bases on two singles and a walk with only one out to show for it. Hughes was taken out of the game for Boone Logan after giving up a run on a single; Logan struck out David Ortiz, but gave up a grand slam to Mike Napoli which passed just over the glove of Ichiro Suzuki to tie the game. After letting the next batter knock in a single he was replaced by Preston Claiborne who got the final out of the inning. The bullpen continued to come up short in the eighth as Claiborne gave up a 2-run shot to Victorino and a single to Mike Carp before being taken out for Joba Chamberlain. Joba got Dustin Pedroia to ground out to first for the second out of the inning, then issued three straight walks to hand Boston their 11th run. Another RBI single made it 12-8 before Chamberlain could strike David Ross out to end the frame. The offense was unable to rally in the last two innings, and ultimately fell by that score. New York will try to salvage the last two games of the series at 1:05 PM today and tomorrow afternoon. The latest loss has put them back behind Baltimore and Cleveland in the hunt for a Wild Card spot. Subject: LongIsland.com - Your Name sent you Article details of "Yankees and Mets Lose in Grand Fashion to Red Sox and Indians"